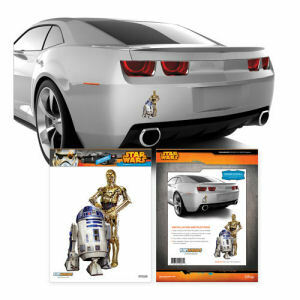 We have Just Sold out of Star Wars C-3PO and R2-D2 Mini Vehicle Graphic. This Item is unavailable at present. From the Star Wars collection by Fanwraps. Star Wars C-3PO and R2-D2 Mini Vehicle Graphic. C-3PO and R2-D2 Graphic measures 9 inches tall by 7 inches wide. After installation the decals can be easily removed but not reapplied. Safe on all automotive paints and finishes.